After the show we decided to take both Archimedes and EGO out to Canowindra for some free flights. 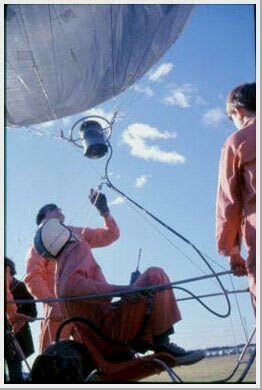 None of us had ever piloted a balloon untethered. John Holmes and I had flown briefly as passengers, the sum total of the groups experience. 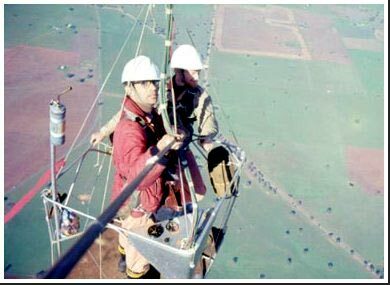 At that time, 1965 there was no formal balloon training, although a few of us were trying to initiate a pilots licencing scheme with the then Department of Civil Aviation. Now CAASA. 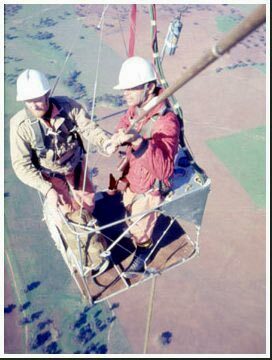 It was illegal to fly a balloon unless it was tethered, (Max height - 200 ft ). To fly free, (untethered) we had to travel beyond controlled airspace. This meant a journey of 250Kms (150 miles) west from Sydney. In NSW, the only permissible free flying was as far out as Canowindra, Orange, Parks, etc. On the left is the original Archimedes as it looked in 1963. On the right, in 1965. 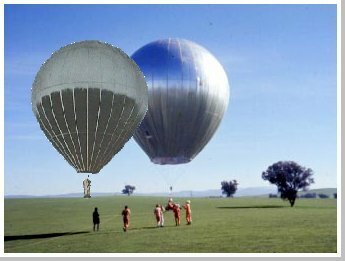 A computer comparison shows the same small balloon after our many modifications. 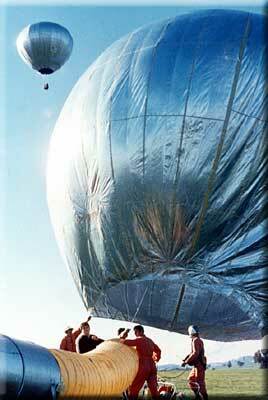 We enlarged the balloon mouth, necessary with the more powerful burner. We re-organised and simplified the suspension harness so that there were 14 steel cables instead of 28. As mentioned earlier, Archimedes was designed for shows. It was quite unsuitable for free flights and the gondola,(basket? seat?) with its sharp legs, was hurriedly rebuilt for that weekend. It was remade as a simple sledge, and a cradle for a larger fuel tank added. The burner now hung from cables instead of being rigidly attached to the gondola. As time ran out, there was no pilot light for the burner. There had been no time for testing. Archimedes was not really safe to fly. As soon as we lifted off, I could see a photographer from "Life Magazine" beckoning and yelling to us, "Come back!" If only balloons could do such a thing. If that wasn't enough to worry about, a TV cameraman handed me a movie camera just as my passenger and I took off. After a few seconds, I turned EGO's burner off and we coasted unwillingly to well over 2000 ft before it began to cool and level out. As far as I know, this is the first time ever that two balloons flew at Canowindra, possibly in Australia. From high above in EGO, we could see Gary Smith lifting off in Archimedes. When EGO began to descend, I turned on the burner. It refused to light, the pilot light had gone out. 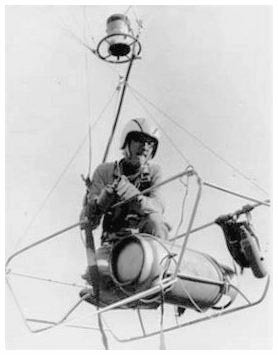 After climbing to over 1,000 ft, Gary Smith was also unable to re-light Archimedes burner, and had a very heavy landing. We were fortunate there were no serious injuries. Both Archimedes and Ego were only adequate for tethered flights at shows, and had many problems in free flight. We had no sensitive control over buoyancy. A blast from the burner did little - until a minute or so later. 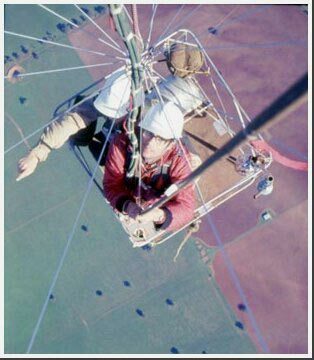 Keith & I about 4,000ft above Canowindra. We both wore parachute harnesses. The parachutes themselves can be seen stowed at the side of the gondola. The instrument panel behind me had an altimeter, rate of climb indicator, a button to (usually) electrically ignite the pilot light, a lever to send fuel to the burner and finally another lever to purge the gas line after landing. We carried Teijins' old drag rope on this flight. It can be seen dangling below the basket. We also dangled the camera pole during take-off. Note the small gas bottle on the pole. It was our emergency pilot light to deal with burner failure. Keith and I landed heavily on this flight after EGO dropped cold from over two thousand feet. My helmet was thrown off and the small gas bottle hit me on the head causing slight concussion. Days later I discovered I had bruised ribs from the impact. This was actually my last ever flight in EGO.